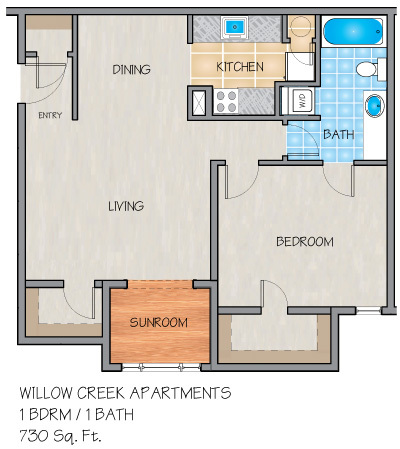 Please send me more information about Willow Creek Apartments. You have finally found New Orleans living at its best. 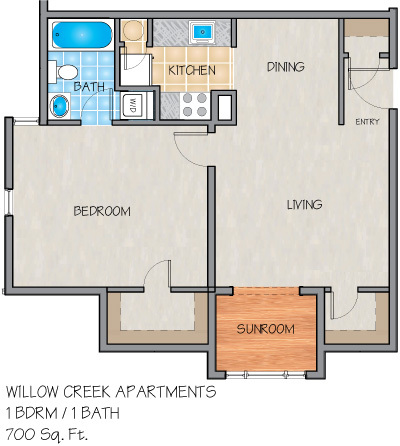 Willow Creek Apartments is a River Ridge, LA apartment community in The Creeks of River Ridge. It is a small community nestled within a gatehouse entrance, surrounded by majestic oak trees in lovely River Ridge. 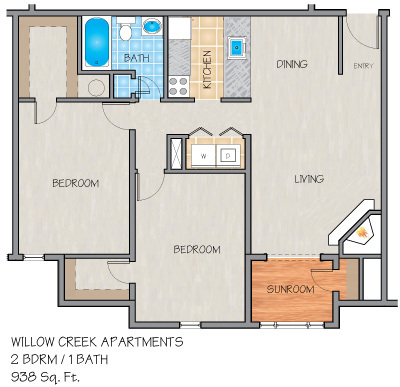 Our apartments offer an abundance of amenities including wood-burning fireplaces, washers and dryers, large oval tubs, personal intrusion alarms, plush carpeting, sunrooms with faux-wood flooring and more! Relax and take a stroll down our beautifully landscaped paths, enjoying the free-flowing creeks and fountains, or relax by the pool. 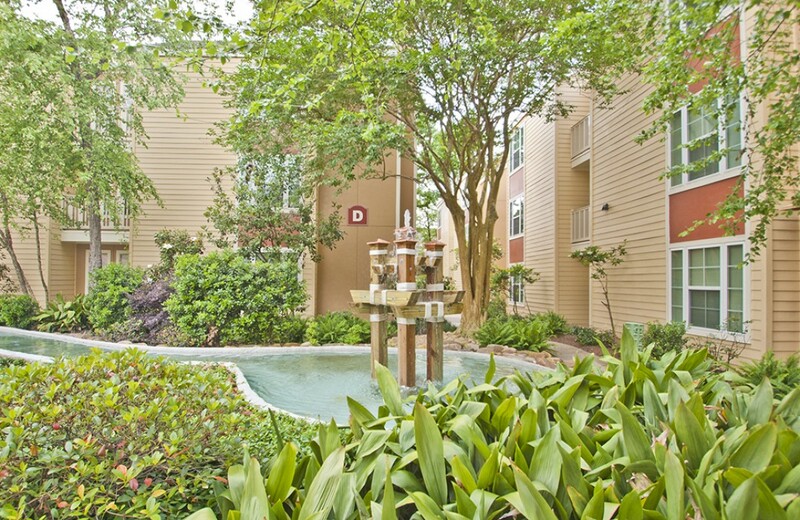 Let yourself experience the best in a garden community with park-like features, located in Elmwood Business Park just minutes away from Downtown New Orleans. Conveniently located near the Huey P. Long Bridge, Earhart Expressway and Interstate-10, enjoy easy access to shopping, restaurants, work and entertainment. 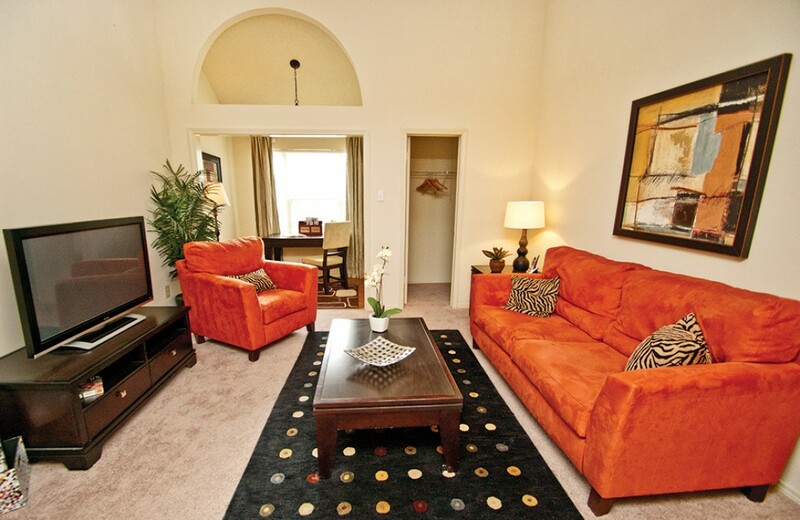 Our location is also ideal for individuals attending local area universities such as Tulane, Loyola, and Xavier. 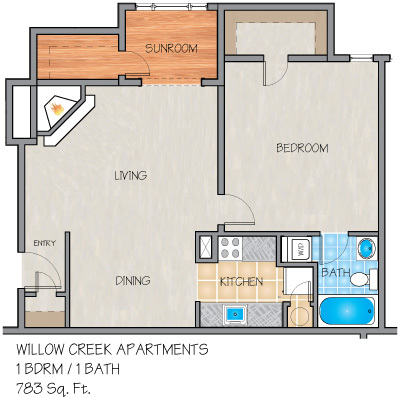 If you are looking for an apartment for rent in River Ridge, lease a lifestyle and rent today. Willow Creek is a beautiful community. Neighbors are quiet and courteous, the staff make sure that residents are satisfied, and maintenance is prompt. Overall, a great place to live. Really wonderful place to live, management is wonderful, neighbors are very nice so happy to be living here. Willow Creek is a beautiful community. Neighbors are quiet and courteous, and the staff make sure that residents are satisfied. Overall, a great place to live. 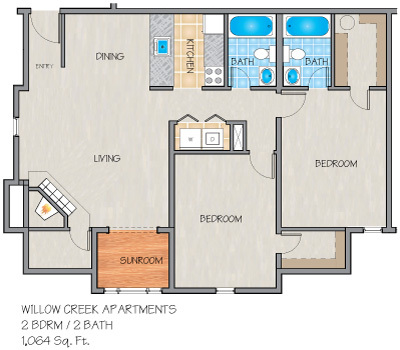 moved into Willow Creek Apartments in June of this year. I have been very pleased with my stay here. The office staff has been nothing but helpful and always puts the best interest of the residents to heart. I love the area, the landscaping, the apartment and the atmosphere. The move in experience at Willow Creek left nothing to be desired. Staff were extremely helpful, and maintenance came within two hours of submitting the move in checklist. The complex is quiet and friendly. We loved living there. Safe, clean, green, quiet, well managed and maintained! Would recommend! 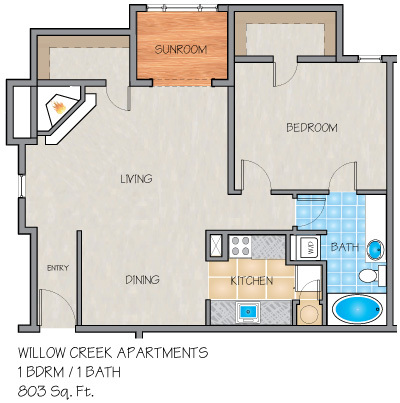 Living at The Creeks of River Ridge - Willow Creek, is fantastic! The best decision I've made this year. I have lived here for 2 1/2 months. The residents are quiet and friendly. The manager and Amber are amazing! All maintenance work done immediately after a request. I love it here. Nice Apartments Overall The apartments aren't so bad here, the interior furnishings could use an update, but overall the maintenance is quick to respond and the grounds are well-kept and clean. It's relatively safe here too, crime-wise, which is important as well. Not bad overall for apartments. I moved into Willow Creek about 6 months ago, and I have had nothing but great experiences. When there are problems I tell the front office and my problem is usually rectified either that day or the next. I have even recommended the complex to others who have moved in and love the complex as well! So I must be honest, I've given up on ever getting any help with my neighbors. They are loud and annoying at night. They throw things at the wall (sure sounds like it when I'm woken up at 2am). If not that I have to hear ghetto yelling "AHHH GURRRL YAAAAAS HAHAHAHA" or when they have a guy over. I have called the office many times and the cops. Nothing has ever been done. So here's to being woken up a few nights a week when I have to get up in the morning! Other than that, staff is nice and it's a somewhat decent place to live. I guess hearing my walls shake listening to rap music ruined it for me. P.s. I've been woken up to the sweet sounds of a headboard hitting my wall and a girl yelling "OH YES OH YES DO IT BABY"
My boyfriend and I have lived in Willow Creek Apartments for almost 2 years. Everytime I have asked for a maintenance they have got it done in a timely manner. The grounds maintenance lady is very nice and you can tell she works hard to keep the swimming pools clean. The ladies in the office are very nice and friendly. Very convenient for me (2.5 mi to work vs 60 miles at previous residence. Issues are fixed in a timely manner. Priced decently for location. The best complex that I have ever lived in. The management team is very courteous and the landscaping is beautiful. I would recommend this complex to anyone.